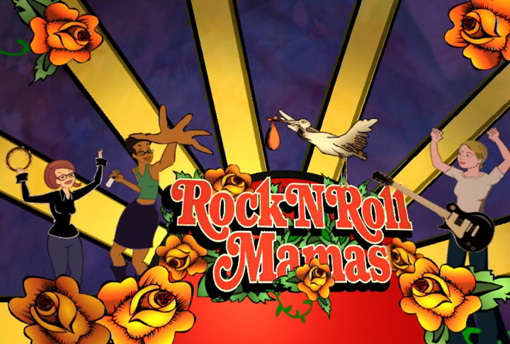 Review: Rock N Roll Mamas / It's Just Movies Review: "Rock N Roll Mamas"
The most unfortunate part of this documentary on mother rockers is that no one really seems happy. An obsession with performing drives them in vans, buses and airplanes across town, country and world. One singer tiredly exclaims in the fall, “I’ve been homeless since New Year’s.” Well, so has her child. This doc follows three different moms from the Portland, Ore., area who perform. They talk of exhaustion and guilt. Ms. Su’ad AbdurRafi’ justifies having a day job and performing at night by saying that her rapping makes her happy and this assures her child of having a happy mother. Zia McCabe — keyboardist, bassist and vocalist with the Dandy Warhols — talks about exhaustion and notes that after partying she could sleep, but with a baby there is never time to recover. Kristin Hersh, the third performer and the one pictured above, is lucky to have a caring husband who works as her manager. However, after 20 years and four children, she has cut back touring to a few months of the year and has bought a house. There is a difference between a successful performing mother, like Madonna, and these women. Money. Madonna can afford to indulge in her passion and still provide for her children. These women have a harder time. It’s always a wrenching issue over, “Who’s going to take care of baby when I’m onstage?” They care deeply, but they also shuttle their children from place to place without giving them the opportunity to develop friendships or a stable home geography. Hersh’s oldest child, aged 20, says he has had no chance to really make friends because they move around a lot. While the children do participate in online home-schooling, the chances for relationship-building amongst their peers is not possible. The problem with this, from my 64-year-old Donna Reed perspective, is that the children suffer in order to provide a mercurial dream for the parent. I kept waiting to hear performances that would legitimize the sacrifice everyone had to make to support mom’s music career. They are few and short. One clip of Matilda McCabe, with her hair transformed into curls, was pretty good. But to be honest, the whole time I was watching this doc I was wondering what the psychological issues were behind the performers that compelled each to keep on trying despite marginal success. It doesn’t matter if the musician is male or female. Some are really talented and you understand this type of career is a calling. Others aren’t being practical or realistic. Perhaps they are working through some soul searching or an issue related to acceptance. The problem is, life isn’t a solo act. Whether we are in an 8-5 job or sent around the world, people of experience will remind the younger ones that life and its true fulfillment is about family and relationships. “Rock N Roll Mamas” plays on Aug. 28, 2013, at the NWFilm Center as part of the Northwest Tracking series which focuses on the work of independent filmmakers living in the region. The Dandy Warhols are actually an excellent band. Yes,Sean, the Dandy Warhols are intellectually and musically talented. I’m sure if they accepted me in their group I’d be trying to mix parenthood and performing. It’s just tough being a single mom when you want to be bringing up your child while you are touring the world.